Before we start looking in the mirror, let’s talk about the mirror itself. The mirror consists of three “views,” including: Effectiveness, Efficiency, and Transformational Organization. These represent the three management domains that are operating or “in play,” as the organization attempts to fulfill its public purpose within ever-changing operating environments. The Profile is research derived and broadly defines the characteristics of a charitable-philanthropic organization that has achieved and sustained high levels of results and performance in that area. The Profile provides a definitional benchmark for the questions that follow. 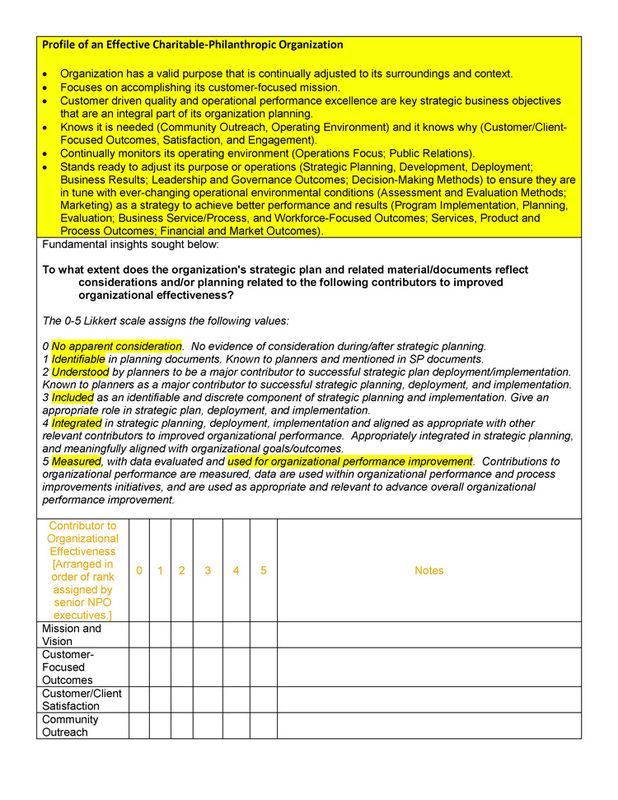 All three views address the fundamental question: to what extent does the organization’s strategic plan and related material/documents reflect or provide evidence that important contributors to improved organizational performance have been assessed for their relevance to the organization’s purpose and goals, and incorporated as appropriate into the organization’s strategic plans and processes? 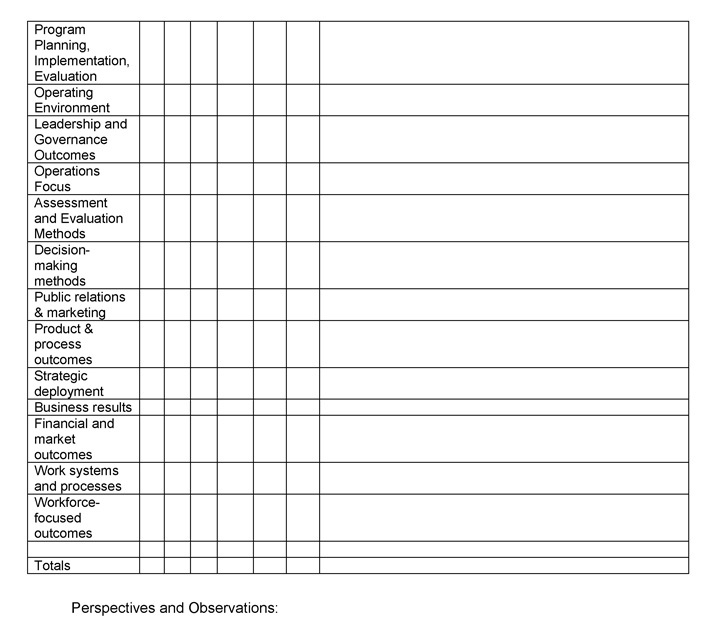 A Likert scale based on the extent to which these management contributors are apparent in the strategic plans and related documents, offers the assessor a means to more accurately report the extent to which these contributors to excellence are identified in the strategic planning process, and how they are used for organizational performance improvement. The “contributor list” was derived from management research during which senior C-NPO executives identified these management actions and outcomes as major contributors to organizational performance improvement. The list is arranged in order of the rank that was assigned by senior NPO executives in the national survey. For example, in the Effectiveness Domain senior NPO executives ranked Mission and Vision as their top contributor to organizational effectiveness, closely followed by Customer-focused Outcomes. The list was designed to provide a quick reminder to participants of these vital management actions and activities, even as they determined whether or not these topics appeared in their strategic planning documents and/or process.